Not a great day for me. Hope others had better luck. Raining and snowing pretty hard in much of the park. I was surprised Dunrraven stayed open, but it snowed more on the Norris-Canyon road and south to the lake and more. I drove out of Lake Butte without seeing a thing, then went over Dunraven out to Lamar Canyon. 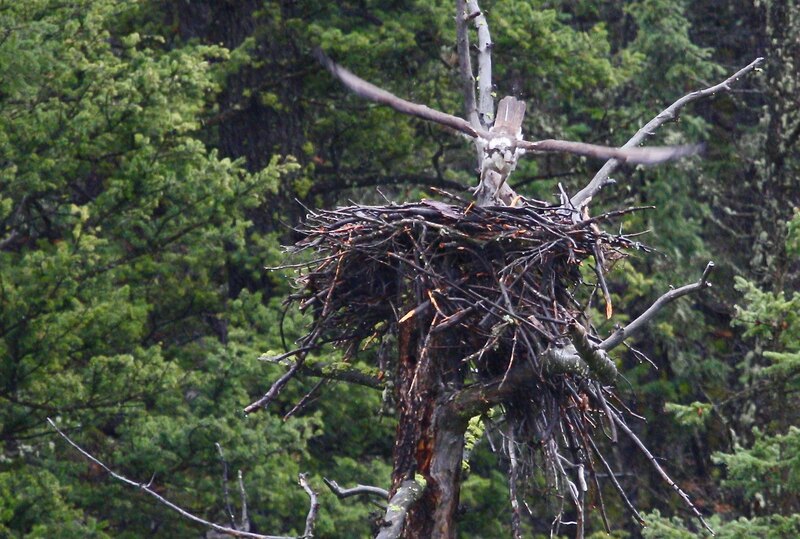 An osprey was on the nest, and a youngster popped its head up a couple of times. As I got back toward Roosevelt, cars were stopping in anticipation of a black bear, which finally showed up in the area where the horse and coach trail is, across from the toilets and gas station. It came across the road and poked around a bit. Most of my photo attempts have raindrops in them, as do the osprey pix. I decided I might as well head back to West. The grizzly with two cubs was out in a meadow just north of Tuff Cliff a mile or two, but it hid as soon as I got there, and I never did see it. Maybe tomorrow. It's interesting to see how much water there is in the park this year. Gibbon Meadows is more like Gibbon Lake, same with the area south of Norris campground and the Cascade Creek area near Canyon. LeHardy is no longer a rapids because the water's too deep. Fishing Bridge almost isn't long enough to cover how wide the river is there now. Last edited by lah on Mon May 28, 2018 6:27 pm, edited 3 times in total. We had the same lack of luck with the bad weather on this day. Saw virtually nothing but rain drops, sleet, and snow all the way from Moose Junction all the way up to Mammoth. We were prepared to get wet and protect the gear, but we never saw anything. Guess it will have to wait until next year now. Yes, 12Hrs., today's weather was a lot better until around 4:30, when it rained really hard from Tower store down to about Madison, but there didn't seem to be anything to see then anyway.